Pigeon. It seems that most people either love or loathe this pose. Some cite knee issues or tight hips as the reason for staying clear of it, while others enjoy the deep stretch of the muscles around the hip joint. The following sequence is for those firmly in the “just say no to pigeon” camp—because there are many other ways to move the hips through the flexion, external rotation, and abduction that pigeon offers without having to actually assume the pose. This sequence works well as a warm-up to sun salutations, as a floor-based cooldown, or as a stand-alone practice, and takes about 15 to 20 minutes to complete. Do the entire sequence on the right side before switching sides. Have a strap, two blocks, and a blanket handy. Additionally, you may want a bolster for savasana. Start in a comfortable seated position. Anchor your sitting bones, lengthen your spine, and attempt to release tension or holding from your hips. Take several deep breaths, focusing on grounding and relaxing your hips. From your seated position, bring the soles of your feet to touch, knees bent out to the sides. 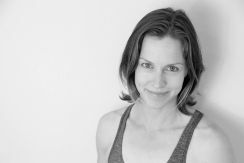 Lengthen your spine and tip your pelvis forward (anterior tilt) as you walk your hands toward the front of your mat and fold forward from your hips until you feel a sensation of stretch, perhaps in your hips and maybe in your back. Let your hands and arms rest on the floor in front of you or on blocks. Stay for five breaths and then inhale to bring your torso back to vertical. Keep your right knee flexed and straighten your left leg, making sure that each leg is open to approximately the same degree. Fold forward between your two legs until you experience a stretch, probably in your left inner thigh, and stay for five breaths. Inhale to bring your torso back to vertical. Root into your sitting bones and sit up tall, tilting your entire torso slightly forward from your sitting bones to prevent the weight of your leg from causing you to round your spine. Begin to gently rock your right leg back and forth across your body. You can start off with it low and rock side to side as you gradually bring it up, closer to your body. And remember that the hip is a ball-and-socket joint (the head of the femur, your thigh, is the ball) with the potential for movement in all directions—explore them all! Then bring your right shin directly in front of your torso and as high as possible, as close to parallel to the ground as possible. Stay for five breaths. Bring the sole of your right foot to the ground outside your left thigh, straightening your left leg if you had it bent. Catch your right knee, which should be pointing up to the ceiling, with your left hand or left elbow. Place your right hand on the floor about half a foot behind your right hip, inhale to lengthen your spine, and then exhale to twist to the right, initiating the twist from your mid-back, and looking over your shoulder. Stay for five breaths and then inhale to return to the center. Bring your right foot to the floor inside your left thigh, as close to your groin as possible, then open your right knee to the side, and actively press your right foot into your left inner thigh. Inhale to lengthen your spine and exhale to tilt your pelvis anteriorly as you fold forward over your left leg, directing your navel toward your knee. Stop when you feel a stretch in those hamstrings, or perhaps in your left hip/buttocks. You can rest your hands on the floor or on blocks. Stay for five breaths and inhale to come back up to vertical. Hold your bent right leg as you did in rock the baby and then recline onto your back with your left leg stretched out. If it’s more comfortable, you can keep your left knee bent and your left foot planted on the ground. You also can place a folded blanket under your head for comfort if you wish. Perform the same movements as in rock the baby for a total of five breaths. Bring your right knee back into your chest and then loop your strap around your right heel (you can bend your right knee to get into position), holding the sides of the strap in either hand as close to your foot as possible while keeping the backs of your shoulders relaxed toward the ground. Straighten your right leg and gently draw it toward you until you feel a stretch through the back of your right thigh (you don’t necessarily need to straighten your leg completely; rather, your goal is to experience a good stretch in your hamstrings). Hold for five breaths. With the strap around your heel, start to open your right leg diagonally out to the right side, reaching through your heel. Place your left hand on your left hip bone or thigh to gently ground it. Stop when you feel a stretch, most likely in your right inner thigh. Stay for five deep breaths. Use your strap to bring your leg back to the center and then take it across your body, on a diagonal to the left. Keep your right heel higher than your right toes to emphasize the internal rotation of your right hip. Aim to feel a stretch in your right outer hip and thigh. Stay for five breaths and then guide your right leg back to the center and remove the strap. 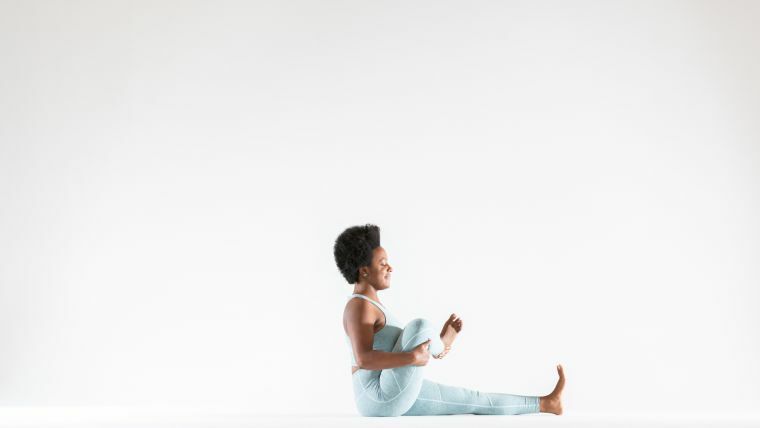 Hold your bent right leg as in reclined rock the baby—it will stay stationary in this pose. Inhale and lift your (straight) left leg up 90 degrees so that the sole of your left foot faces the ceiling. Exhale and slowly lower your left leg, leading with your left heel, until your leg hovers one inch from the floor. Repeat four more times, but on the fifth time keep your left leg at 90 degrees. On the fifth exhale use your core muscles, while cradling your right leg, to roll all the way up to a seated position with a tall spine. Release your right leg. Now repeat the entire sequence on your left side. After you have done the left side try bound cobbler pose again and notice where your knees are in relation to the floor as compared with the first two times you did the pose. You will probably have more range of motion in both hip joints without having done a single pigeon pose! 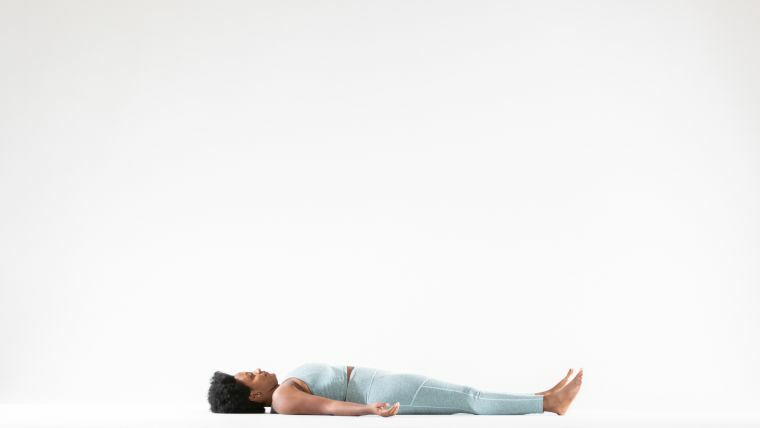 For a finishing relaxation pose, take savasana or find a variation of reclined bound cobbler in which you do not feel any stress or stretch in your legs, hips, or back. This could mean placing a bolster under your knees and upper thighs or stacking blocks padded with a blanket under each knee. 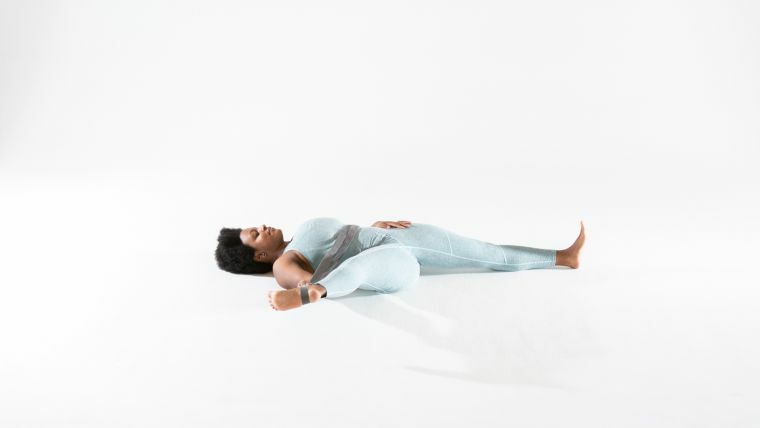 Stay for five minutes, breathing in a relaxed manner, and adjusting any props if you need to so that the ground supports your legs and your hip muscles are relaxed. 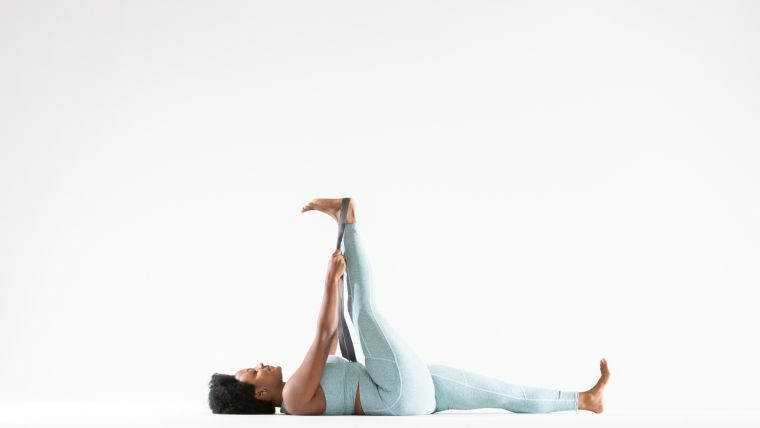 Try to direct your focus to relaxing your hips, low back, and legs—all of which may experience greater range and relaxation from working through the sequence above, no pigeon required!